After a remarkable rookie season that propelled the Yankees to the first of four consecutive championships, Joe DiMaggio quickly joined Lou Gehrig as the "toast of the town". Various New York sponsors jumped at any opportunity to utilize "Joltin Joe's" immense popularity to promote company related products, with Hollywood also interesting in capitalizing on the Yankee Clipper's incredible reputation. Indeed, DiMaggio would eventually land several parts in four motion pictures, the first being "Manhattan Merry-Go-Round", an American comedy film directed by Charles Reisner. Dimaggio would play himself, a star baseball player, with the cast also including actor Henry Armetta playing the role of "Spadoni". 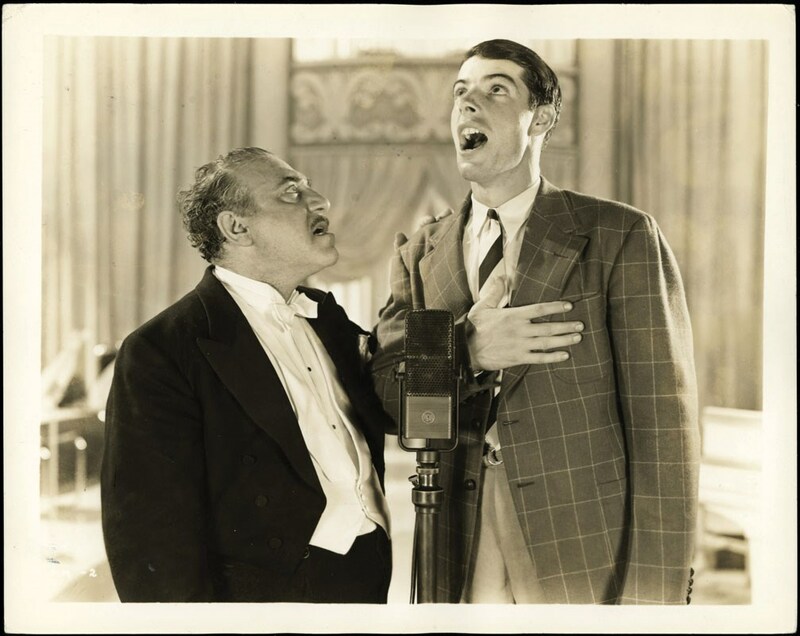 This ultra-rare photo depicts a scene from "Manhattan Merry-Go-Round" with the immortal "Joe D" belting out a tune in front of a microphone with Henry Armetta at his side. 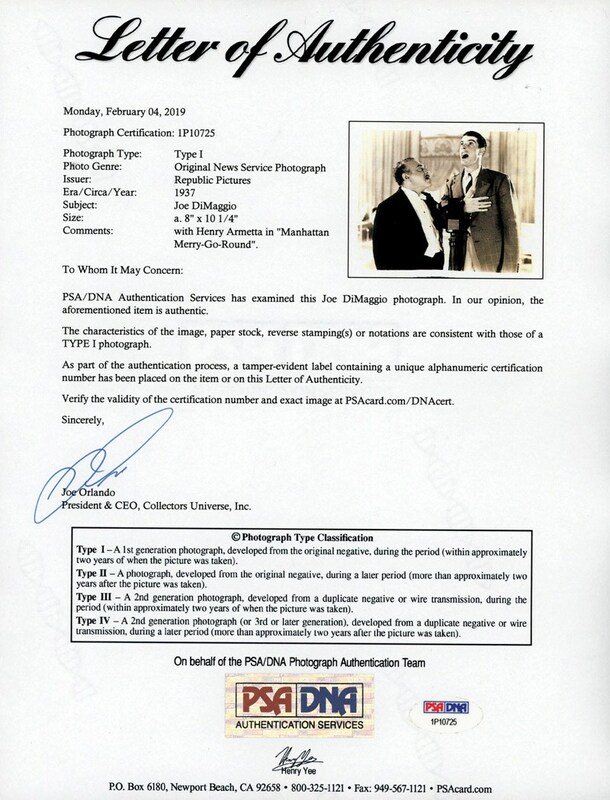 The image reveals unparalleled contrast and clarity, and we cannot imagine any 80+ year-old photo emanating finer aesthetics. 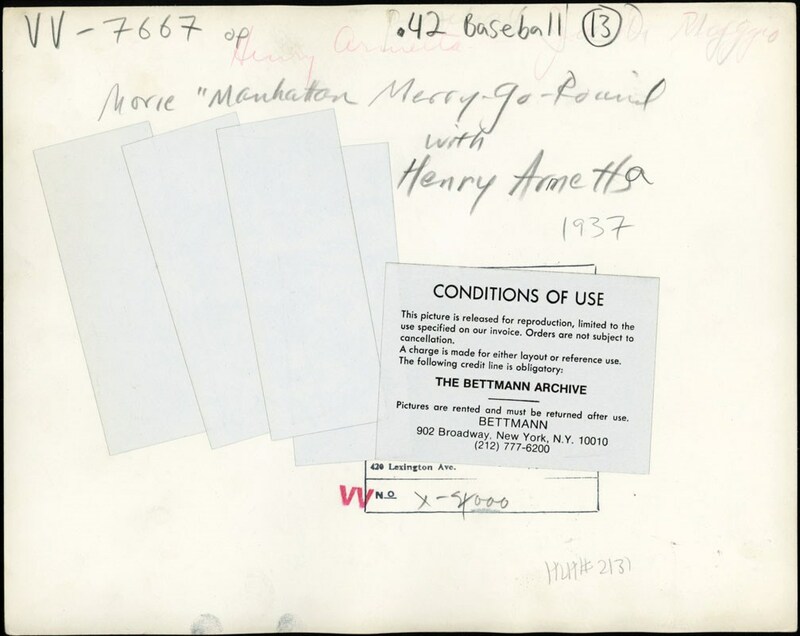 No glaring surface blemishes are apparent, some expected modest corner-wear exists, and the verso reveals a written notation: "Movie – Manhattan Merry-Go-Round" with Henry Armetta – 1937". A truly captivating heirloom from the Yankee Clipper's rookie era, it stands as a monumental testament to a player that stands as one of the finest centerfielders in baseball history. In 1969, sportswriters voted DiMaggio the greatest living ballplayer; with that being no small feat considering Willie Mays, Hank Aaron, Mickey Mantle, Ted Williams and Stan Musial were all alive when that renowned vote was cast. We cannot imagine any player who commanded the unparalleled respect of this baseball icon who via his remarkable baseball prowess and marriage to Hollywood bombshell Marilyn Monroe will forever stand as an embodiment of a National hero!